DEERFIELD, IL (August, 2017) – The vast expanses of the Gobi Desert are a prime destination for paleontologists. Since the 1920s, expeditions to the Gobi have unearthed thousands of dinosaur fossils, including the nests and eggs of Oviraptor, the bones of the iconic Velociraptor, and the skeletons of the giant plant-eater Saurolophus. Today, a very different type of behemoth rumbles through rural Mongolia. It's called the Moveable Dinosaur Museum, and it's changing the way school kids learn about paleontology. Apart from the giant sauropod dinosaur adorning its sides, the Movable Museum looks like an oversized tour bus. But inside is a 250-square-foot exhibit space with modern, engaging displays designed for children and curious adults to learn all about dinosaurs. Despite the long history of paleontology in the Gobi, many Mongolians have never visited a dinosaur museum. Filled with scaled-down exhibits, the Moveable Museum travels from town to town, bringing a museum experience to rural and urban areas of Mongolia. "The population of Mongolia has broad access to both the internet and higher education, but there's little focus on paleontology in schools and almost no information available about dinosaurs online in Mongolian,"said Thea Boodhoo of the Institute for the Study of Mongolian Dinosaurs (ISMD). "Students who visit the museum as part of a workshop are given an activity to find all the Mongolian dinosaurs on board. The workshop gives them an accurate sense of how important Mongolia is to the field of paleontology, and how close to home these dinosaurs really are." The Movable Museum is a project of The Institute for the Study of Mongolian Dinosaurs, a nonprofit organization founded by Mongolian paleontologist Bolortsetseg Minjin in 2007. She has led dinosaur workshops in Mongolia almost every summer for the past decade, and secured the Moveable Museum as a donation from the American Museum of Natural History in 2013. To get it shipped to Ulaanbaatar, she enlisted the help of philanthropist Gerry Ohrstrom and Epicurus Fund. In 2015, she organized its first outreach expedition outside the capital, running a crowdfunding campaign to bring it all the way to the world-famous Flaming Cliffs in the Gobi Desert. The local community at the quarry where Protoceratops and Velociraptor were discovered has been historically overlooked in paleontology outreach. 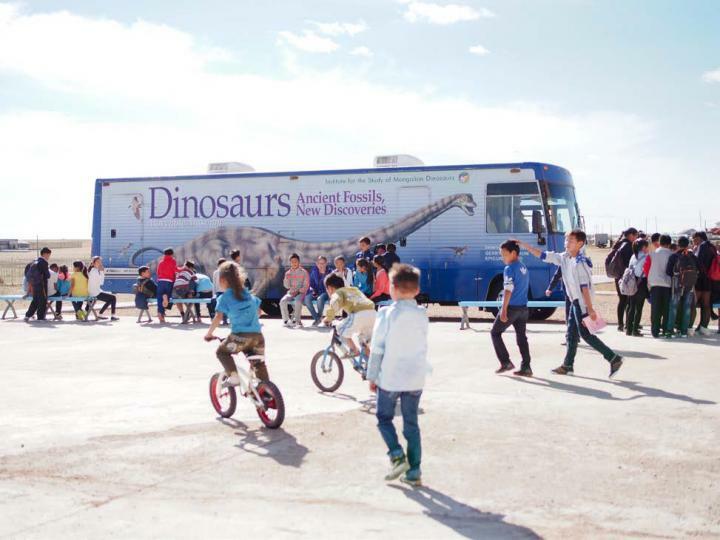 Boodhoo joined ISMD in 2016, and together the team secured funding to conduct a second outreach expedition across rural Mongolia, reaching approximately 1000 students and teachers – many of whom had never seen a dinosaur museum before. Workshops and tours were led by Bolortsetseg and Mongolian educator Binderiya Munkhbat. "Since I don't speak Mongolian, I'm really just a photographer on these trips. But it's amazing to watch the kids light up when Bolortsetseg tells them about the incredible animals that lived in their own back yards," Boodhoo states. At the annual meeting of the Society of Vertebrate Paleontology, Boodhoo reported on the Moveable Museum's two seasons of education and outreach in Mongolia. They still face a few challenges. "It's the only vehicle of its kind in Mongolia, so mechanical repairs can be time-intensive and costly," said Boodhoo. Keeping the vehicle safe from the icy blasts of winter is also a challenge, since no indoor parking facility can accommodate the titanosaur-sized truck. Everyone at ISMD hopes the Moveable Museum will ultimately help protect Mongolia's fossil sites, which are among the richest and most important in the world. The smuggling and sale of Mongolian fossils has been an enduring problem, resulting in the scientific loss and damage of countless irreplaceable specimens. By working with and teaching the people who live closest to the sites, Bolortsetseg says, "we can show how local communities can benefit from sustained dinosaur-based tourism by protecting fossils in place. This is a challenging balance, and we hope to inspire some local kids to become paleontologists themselves." Figure 1. Children mill around the Moveable Dinosaur Museum as it visits their school in Mandalgovi, located in central Mongolia about 300 km south of the capital, Ulaanbataar. Inside, the vehicle houses a 250-square-foot exhibition spaces displaying the latest in dinosaur discoveries. Figure 2. Inside the Moveable Dinosaur Museum, a child explores an exhibit on feathered dinosaurs. Workshops challenge students to learn about dinosaur biology and the conservation of fossils as unique scientific resources.